Uh-oh I’m having a blast from the past flashback. Do you remember Campbell’s canned Spaghetti0’s? I’m talking about back in the day before they started making them “nutritious” -yeahhhhh.Â Â All you had to do was get out the can opener, dump them in a small sauce pan and cook until hot or if you’re like me eat them straight out of the can cold. I could eat a whole can myself, and truthfully I did eat whole cans of Spaghettio’s as a meal when I was in college. There is just something delicious about the sweet tomatoey-cheesey sauce that made theÂ irresistible. 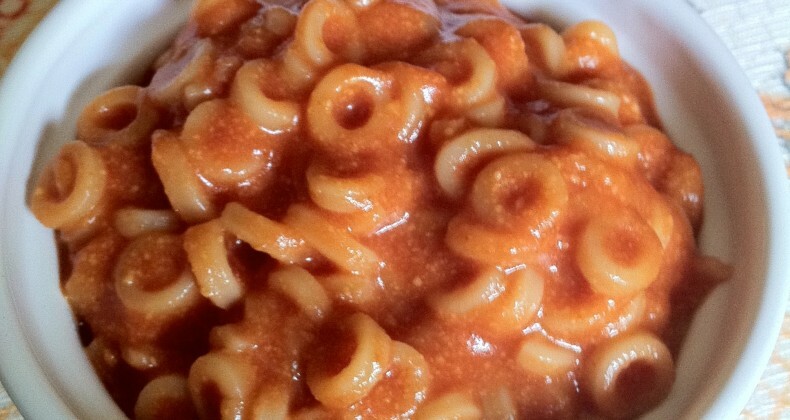 It has been a long time since I’ve even thought about Spaghetti-O’s. My daughters may have only had them a couple times in their short little lives. I’m pretty much aÂ perimeterÂ shopper at the grocery store and unless they are on an endcap I really don’t think about them.Â Well that changed three or four months ago when Isa from ThePPK made Vegan Spaghetti-O’s that peaked my interest. I never thought about making spaghettio’s at home before. In fact I’ve never even seen the little O-shaped pasta at the grocery store. Fast forward to last month I found a box Creamette large rings at the grocery store. Instantly I thought about the possibility of making Spaghettio’s at home for the girls, so I picked up a box. After a month of procrastinating I finally made them. The girls loved them and I thought they tasted pretty authentic. The biggest surprise to me was how easy it was to whip up a batch, especially since I like my spaghetti-o’s plain with NO meatballs or franks (ICK!). This recipe makes enough for a small army so invite some friends over and enjoy a food from your childhood. Boil pasta in salted water according to instructions on the box, drain and set aside. In a large sauce pan over medium heat melt butter and olive oil together. Add grated onion and garlic, sautee for about 5 minutes. Pour in tomato puree stirring to mix in the onion/garlic mixture. Heat through about 3-5 minutes. Stir in the shredded cheddar cheese in batches until the cheese is melted. Stir in sugar, milk, and paprika until well combined. Add in the pasta stirring to coat.